When a Gold Rush Is Not Enough! Hippies, criminals, con men, and cult leaders all want a piece of what Harry has discovered in Northern California gold country. 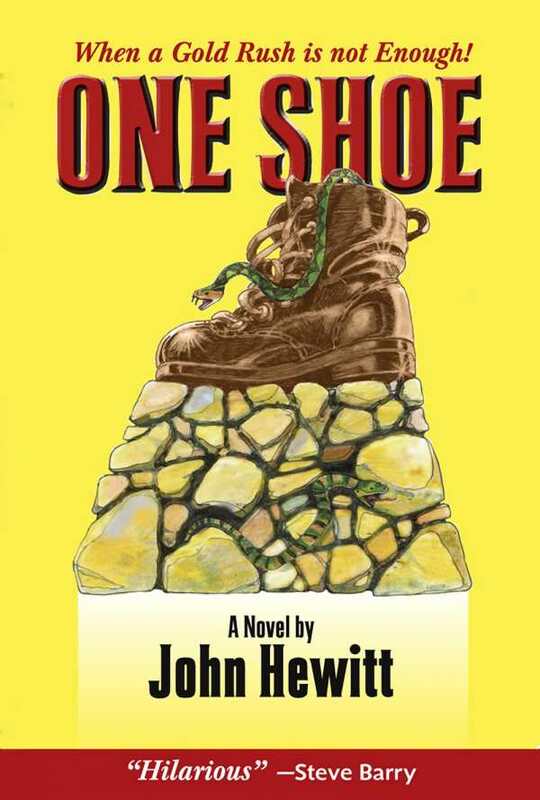 Take a little northern California history, add a touch of Christopher Moore and a large dash of Elmore Leonard, and you’ll get something like One Shoe, John Hewitt’s comedic look at criminals, the media, and the world of gold prospecting. His novel is often frantic and fun, mixing criminals, small town eccentrics, and greed. The eponymous One Shoe is a small gold-rush-era town in Northern California near the Feather River. Protagonist Harry Trout is a likable parolee and, to be accurate, more con than ex-con. Harry’s claim of striking gold ignites a media storm after a gossiping clerk in the assayer’s office lets the news slip. A fledgling reporter jumps on the story and, once social media is thrown into the mix, the town of One Shoe becomes the center of attention for all sorts of unsavory characters, all wanting a piece of what Harry has discovered. The humor in One Shoe comes from an overall levity, snappy dialogue, and a host of characters who are not, for the most part, particularly bright. The most consistently funny interactions are between Harry and his landlord, a woman whose amorous designs for Harry show up, suddenly and transparently, after he makes the gold claim. Another strong comedic setup is the commune called THERE, equal parts spa and cult, where pure-hearted hippies meet rather less-than-pure spiritual leaders. While One Shoe is an intentionally humorous book, it’s seldom slapstick or over-the-top silly. That said, for a novel that seems to emulate the funnier side of crime fiction, the overall tone is so light, so heavily skewed to the fun side, that the crime aspect doesn’t often take on much weight or menace. Though at times One Shoe feels a little too loose, it succeeds in providing a high-spirited comedy, with a solid pace, witty dialogue, and entertaining character interactions.